SEATTLE, WA – September 15, 2016 – ExtraHop, the first and only provider of streaming analytics that transforms network data into actionable insight, today announced the general availability of ExtraHop 6.0. With this release, ExtraHop delivers the industry's first top-down workflow that enables IT teams to go from real-time performance metrics for application, security, network, and business services to associated packets in five clicks or less. This streamlined workflow transforms the network from a commoditized transport function into the richest source of real-time insight. The new capabilities give customers comprehensive visibility into end-users' digital experiences, including direct correlation to the specific data points necessary for rapid restoration and proactive operations. "Traditional domain-centric approaches to monitoring and IT operations management in general are becoming less effective as IT becomes more modular, dynamic and distributed. As business processes digitalize, infrastructure and operations (I&O) professionals discover that their observations and analyses are increasingly relevant to other parts of IT and the business as a whole," writes Will Cappelli in an August 2016 Gartner report titled, "IT Operations Analytics Must Be Placed Within an AIOps Context". Wire data encompasses network, client, application, infrastructure, security, and business data – all data-in- motion. ExtraHop 6.0 builds on the platform's turnkey streaming wire data analytics by introducing functionality designed to ease the evolution of existing IT workflows to meet the demands of modern business. Customers can address the requirements of scale, complexity, and dynamism by automatically discovering devices, systems, and their relationships; observing and measuring their behavior; and rapidly initiating a forensic investigation of performance and security problems by drilling down to the packet level. Application and IT Ops Teams have the data they need to support a seamless digital experience for end-users. ExtraHop 6.0 provides automatic discovery of all IT assets and their relationships as well as the ability to monitor communications across applications. This comprehensive visibility streamlines workflows and enables more agile development and data-driven decision-making. Security Teams gain real-time visibility across the organization, allowing them to assess their actual risk profile, establish policies and detect violations, and monitor ongoing compliance. With precision packet analytics, information security professionals are never more than five clicks from the record of origin for any security incident. Network Teams can leverage the industry's first top-down workflow that dramatically reduces the average time-to-resolution. Unlike traditional models that involve a retroactive packet capture and require network engineers to search through reams of data, ExtraHop takes network teams from metrics to transactions to the specific packets tied to any incident in under a minute, in five clicks or less. Business Decision Makers now have a single platform that delivers the real-time insight they need to take the decisive and data-driven actions critical for modern businesses to serve the needs of internal and external customers, ensure a seamless digital experience, stay secure, and remain competitive. "Every digital experience -- whether it's booking a flight, online banking, lunch courtesy of UberEATS, or receiving medical care -- is supported by hundreds or even thousands of interactions between systems and devices communicating over a network," said Arif Kareem, CEO at ExtraHop. "Ensuring a seamless digital experience means having visibility into all of these interactions and their impact on the business. The network is the only source that can provide that insight. It's not just the transport anymore, and there are people, processes, and technologies to maximize its potential. It's time to rethink the network, and to transform it into what it's meant to be: a rich, powerful source of real-time data for the digital world." Continuous Packet Capture at a sustained 10Gbps puts IT teams within five clicks of the epicenter of an IT issue occurring from any transaction, message, or flow on the network. The ability to precisely identify the records tied to any particular incident dramatically accelerates debugging, forensics, evidence, and data retention. 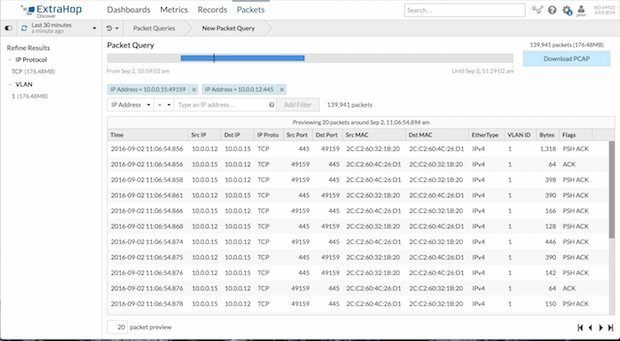 Transaction-to-Packet Correlation allows users to search and download packets linked to a specific device, application, or transaction record. When coupled with the real-time, full-stream analytics and historical search capabilities of the ExtraHop Platform, users have a comprehensive, dynamic, granular, and multi-dimensional view into the most accurate and voluminous source of IT and business data: the network. Integrated NetFlow Analysis combines NetFlow v5, v9, and IPFIX with wire data for broader visibility across interfaces. Built-in metrics for "Top Talkers," "Top Applications," and "Top Conversations" enable IT to quickly identify which interfaces are consuming the most bandwidth in real-time. SSH Protocol Support delivers visibility into sessions with metrics for cipher suites, compression, MAC, and key-exchange to improve security posture. While competitive offerings use pricing models based on indexing or data ingestion rates that prevent organizations from acquiring and storing data, ExtraHop utilizes a per-node model with no data restrictions, and unlimited 'look back' search queries based on customer demand and provisioning. ExtraHop is built based on an agentless deployment model, eliminating the challenges of installing and managing individual agents on every server, machine, device, or other assets in an IT environment. To experience the power of the ExtraHop platform, explore the ExtraHop interactive online demo. "Stack Overflow is the largest online community for programmers to learn, share their knowledge, and advance their careers. When the online forum is having performance problems, you can bet that we hear about it," said George Beech, Site Reliability Engineer at Stack Overflow. "ExtraHop plays a critical role in supporting our community's digital experience by helping us proactively spot performance problems before they impact our users. The new workflow enabled by 6.0 gets us the last mile in record time, surfacing issues and getting us to the specific packets tied to that problem in a matter of seconds." "ExtraHop enables us to get from metrics to packets incredibly fast. We had a scenario where the platform got us to the precise packets we were looking for in about one minute. With other tools, I'd have to go to lunch, then come back to get them," said the Director of Network Services for a National Retailer. "ExtraHop takes the network out of the realm of being a commodity to being a value-added resource for all things IT." To learn more about how customers are saving countless hours and millions of dollars with ExtraHop, check out the Customer Stories page. "Digitalization is setting enterprise organizations on fire, as they must rapidly adjust to the scale, complexity, and dynamism of modern IT architectures. Old processes will be upended and traditional systems outpaced – especially for IT monitoring," said Jim Duffy, Senior Analyst at 451 Research. "Using network data analytics, the common denominator for all internal and external business activity, ExtraHop helps customers regain control of complex IT landscapes." "Even if data centers migrate into the cloud, you still have users, and those users have devices, and those devices need to communicate on the network," said Dan Conde, Networking Analyst for ESG. "All of those communications provide a very rich dataset but it is difficult to sift meaning out of it. With version 6.0, ExtraHop transforms that dataset into insight. The top-down workflow takes users from high-level, real-time data visualization to a specific data point very quickly." "Today's IT organizations are grappling with growing complexity. Containerization and micro-services, software-defined networks, cloud and agile development are all reshaping the landscape of IT," said Nancy Gohring, Senior Analyst at 451 Research. "IT Ops, application developers, security, and networking pros are all looking for tools that can help them collect and make sense of IT data in this increasingly complex environment so they can identify and solve problems faster." "Presidio provides IT solutions to over 6,500 of North America's most forward-thinking middle-market, enterprise, and government organizations. We work with customers to make their digital infrastructure more efficient for traditional businesses today while helping them leverage the cloud, offer mobile-enabled experiences, and secure their sensitive data for the future," said Steven Kornfeld, VP of Corporate Alliances at Presidio. "The new functionality introduced in ExtraHop 6.0 changes the game for monitoring the performance of digital infrastructure, flipping the traditional workflow on its head to create a more scalable, agile model that joint customers can use to transform operations." "ExtraHop takes a fundamentally different approach to network and infrastructure performance monitoring, one that aligns with Gigamon's vision of the future of IT," said Phil Griston, Director of Alliances and Business Development at Gigamon. "With ExtraHop's introduction of continuous packet capture and the streamlined top-down workflow, our joint customers will receive an unprecedented degree of visibility and control over the entire spectrum of IT systems and operations." For more information on how ExtraHop helps VARs, MSPs, and resellers increase market share and drive revenue growth, or to become an ExtraHop partner, visit the Channel Partners page. To learn more about how ExtraHop integrates with leading technologies like AWS, Cisco, Citrix, F5, Microsoft, and VMware using the industry's first-ever Open Data Stream (ODS) technology, visit the Technology Partners page. For more information on ExtraHop ODS, read the datasheet or "Designing and Building and Open Architecture" whitepaper.